Our dispensing pens, bottles and accessories provide effective and economical dispensing for a wide range of liquids. These polyethylene, static dissipative bottles are ESD safe with have an average surface resistivity of 109 to 1010 ohms/sq. The bottles will dissipate a charge of +/- 5000 volts in less than two seconds at 40% RH. LDPE PolySpense Dispensing Bottles feature a unique luer lock cap which accommodates all our blunt end or plastic taper tip dispensing needles. Available in 3/4, 1, 2 and 4oz sizes (1oz = 30ml). 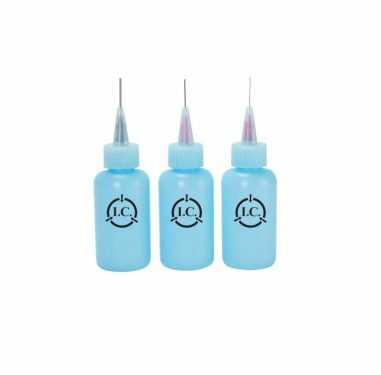 The IDM 7500 Squeeze Jet dispenser is an inexpensive dispenser for low viscosity liquids like cyanoacrylates, superglues, inks, solvents, oils, soldering fluxes and adhesives. Flow-Seal Pens and Bottles are designed to apply controlled amounts of flux, solvents, inks, cleaners, coatings, lubricants, stains, paints & other fluids. The Flow-Seal cap, with its integral valve, provides superior control and prevents flooding and spattering.